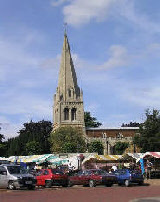 The Wellingborough Branch is one of ten Branches that make up the Peterborough Diocesan Guild of Church Bellringers. For more information about the Guild click here. Bellringers also Ring for other things such as Weddings,Special occasions and Anniversaries etc. We hope you find on the site what you are looking for. Click on the links on the left for details of Towers and Contacts and other information. If you have any comments or suggestions about the Website please use the contact us link on the left.